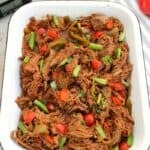 Make meltingly tender beef brisket in the slow cooker with a gentle kick from harissa paste to spice it up! Heat the oil in a large pan and sear the beef on all sides. Boil 250 ml (1 cup) of water and mix with the beef stockpot. Pour the liquid into the slow cooker, then put the beef in the liquid. Put the lid on and cook for 8-10 hours on low until tender. After the 8-10 hours, remove the meat from the pot and shred it using two forks. Once it is tender it will shred or "pull" easily. Discard half the liquid from the base of the slow cooker pot. Add 3 tbsp of tomato puree, 1 tsp of harissa paste, about 20 baby plum tomatoes, halved, and 1 green pepper, chopped. Stir well. Cook on low for another hour or so.